Inscriptions: verso, l.l. in image: "Corita / CORITA KENT was chairman of the Art Department at Immaculate / Heart College, taught, spoke and gave workshops across the country. / Now she prints, paints, writes, illustrates, murals, exhibits and has made / the following: Ugo Betti portfolio (with Elizabeth Bugental); Footnotes / and Headlines; To believe in God, To Believe in Man, To Believe in / Things (with Joseph Pinatauro); City, Uncity (with Gerald Huckaby), and / Damn Everything but the Circus. / Bernard Gunther / BERNARD GUNTHER is one of the pioneers in the use of touch, relaxa- / tion, body awareness, meditation and non-verbal communication in the / total growth process. For seven years he was an innovative member of the Esalen Institute in Big Sur, California. He is the author of Sense / Relaxation, Love View, What To Do Till the Messiah Comes and How / the West Is One." "high cards." Corita Kent in the Grunwald Center Collection. 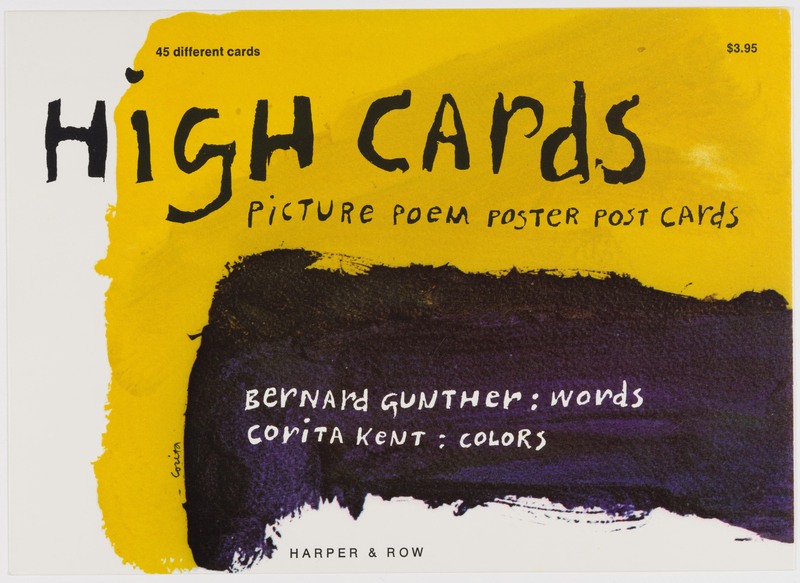 Los Angeles: Hammer Museum, 2017. https://​hammer.ucla.edu/​collections/​grunwald-center-collection/​corita-kent/​art/​high-cards-4692/​.